Thanksgiving and Christmas is right around the corner so I will be sharing recipes that would be perfect on your holiday table until the holidays are over! 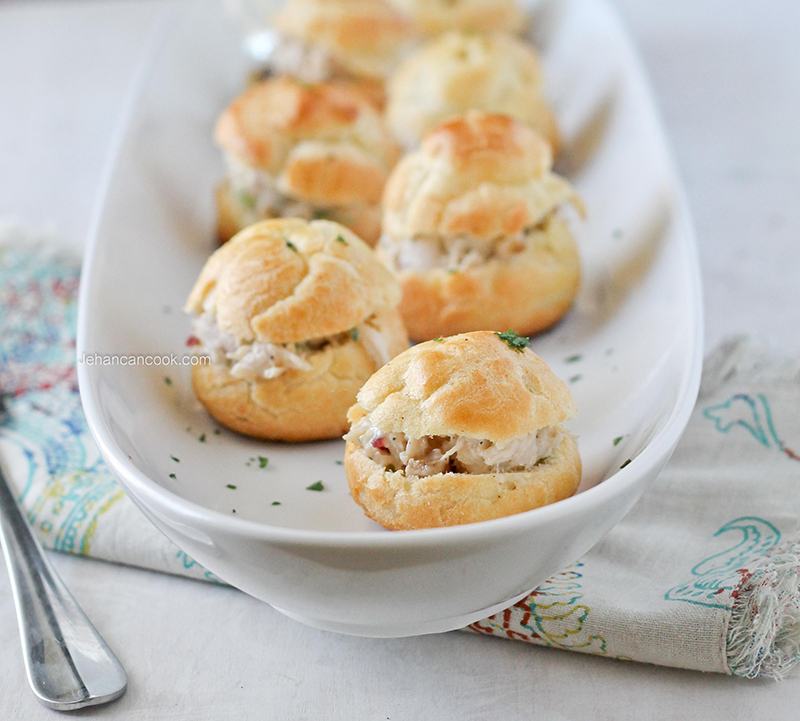 Here we have delightful chicken puffs which are so easy to make! 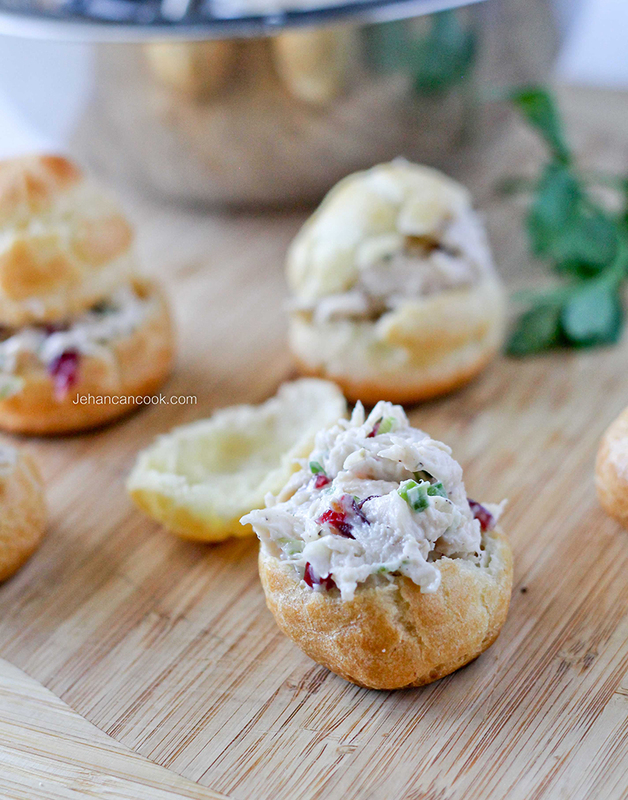 Choux pastry is filled with a chicken salad that’s full of candied walnuts and dried cranberries-very festive! 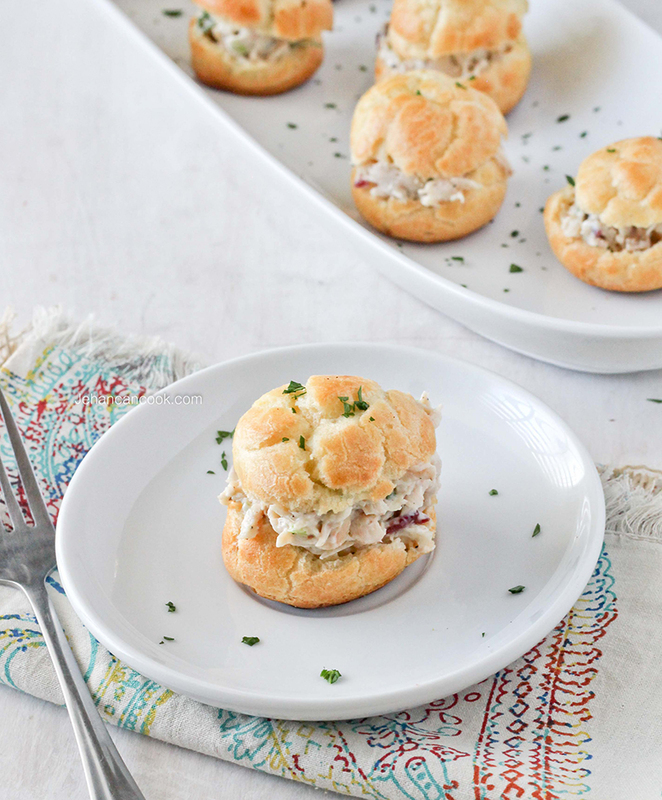 The puffs can be made ahead of time and frozen until you’re ready to stuff it with the chicken salad. If you make these ahead of time you will have to pop them in the oven at 425 for about 5-10 minutes until crispy. The beauty of choux pastry is its easy and versatility, you can easily make sweet or savory with this dough. Fill with whipped cream and dip in melted chocolate to make cream puff or stuff with chicken salad, as I’ve done, for a savory appetizer. This dough is simple to make and just needs to be stirred in a pot; it’s as easy as it gets. You then pipe it or scoop it unto a baking sheet and bakes into these beautiful golden puffs which are crispy on the outside and has a moist cavity on the inside. These are perfect appetizer to serve to your guest which are quite impressive! To make the chicken salad: Mix all the ingredients of the chicken salad together in a bowl until evenly distributed. Allow to sit for at least and hour. This can be made overnight. 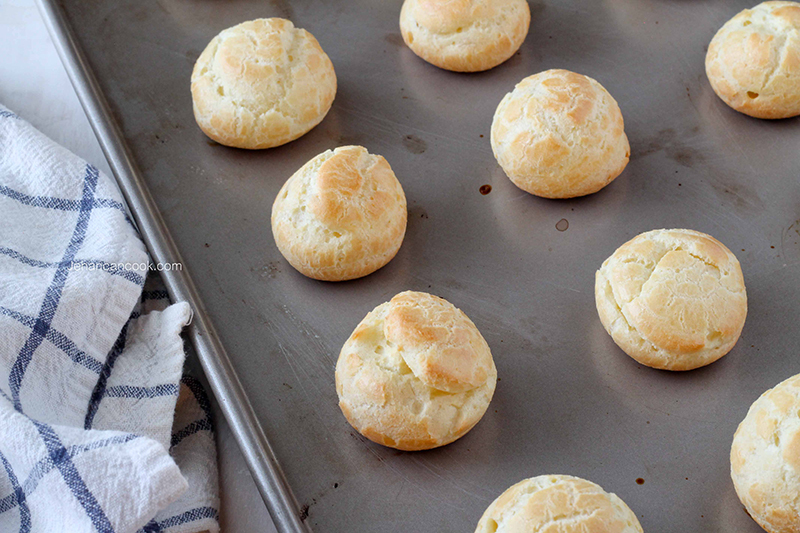 To make the choux pastry: Preheat oven to 425 degrees. Place flour, salt and sugar in a bowl and stir to combine. Heat butter and water in a large pot over low heat; once the butter melts, turn the heat up to medium and bring to a boil. Add flour, remove from heat and stir. The mixture will form a smooth paste which leaves the side of the pan. Do not beat or it will become oily. Allow to cool for 15 minutes. Once the mixture has cooled beat in the egg adding a little at a time (about ¼ of the egg mixture). Once all the egg is incorporated into the mixture, stir until its smooth and glossy, about 5 minutes. You can pipe or scoop the puffs onto a baking sheet. If piping, place mixture into a piping bag and snip off the ends making a large hole. Pipe 2 inch puffs, dampen your finger with water and press down peaks. If using a cookie scoop simple scoop the mixture on to the pan. Allow about 2-3 inches of space between each puff as it will need space to rise and expand. In a small bowl add 1 egg yolk and 2 tbsp of water and beat with a fork. Using a pastry brush, brush dough with the egg mixture; this will make the puffs golden brown and glossy as it bakes. Place puffs into preheated oven and bake for 10 minutes then reduce heat to 350 and bake for an additional 5-10 minutes or until golden brown. Remove from oven and remove from pan and place on a rack to cool. Once cooled, cut off the tops and fill the bottom with the chicken salad mixture, then replace the tops. Garnish with fresh parsley. You forgot to list butter as an ingredient. How much is required? Sorry about that Alicia, I’ve updated the recipe! Thanks you for spotting that error. I love choux pastry.. never stuffed them with a savoury filling before though. Definitely need to try your recipe out, they look delicious! 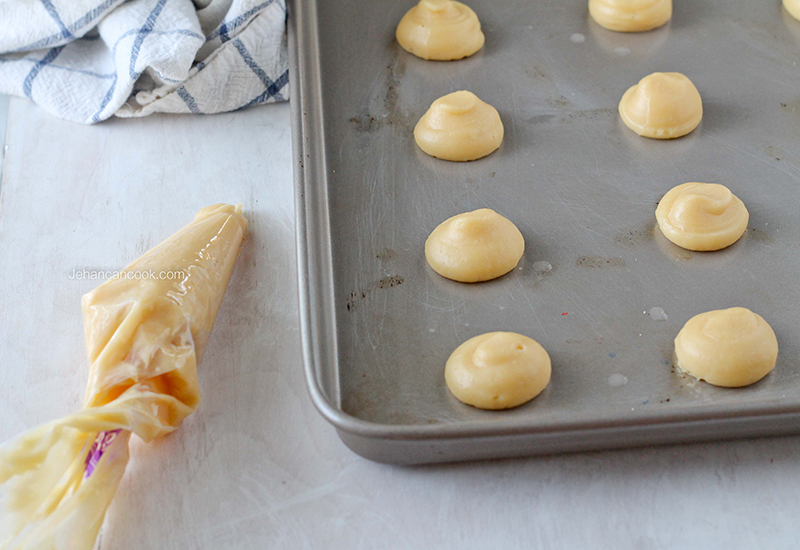 The great thing about pate a choux is how versatile they are when it comes to filling. Love savory over sweet when it comes to these though! Tried this the other day. They came out VERY good. I was running short on time so filled them with store bought chicken salad (which happened to be cranberry almond) and they were yummy. I was prepared for a flop, just bc I had heard that the choux pastry was “tricky” to master. If I can make this successfully, the recipe must be fool proof, LOL. This recipe is a keeper! Don’t be scared to try this, you won’t regret it. Can this pastry be made without eggs? No it cannot, eggs help it to puff up.